This morning we finally got our hands on Apple's iPhone 5. While we are eager to get started on battery life testing, that'll happen late tonight after a full day's worth of use and a recharge cycle. Meanwhile, we went straight to work on performance testing. 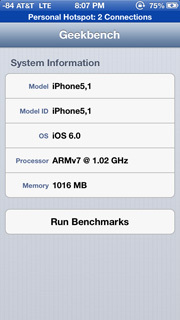 As we've mentioned before, the A6 SoC makes use of a pair of Apple's own CPU cores that implement the ARMv7 ISA. These aren't vanilla Cortex A9s or Cortex A15s, but rather something of Apple's own design. For its GPU Apple integrated a PowerVR SGX543MP3 GPU running at higher clocks than the dual-core 543MP2 in the A5. 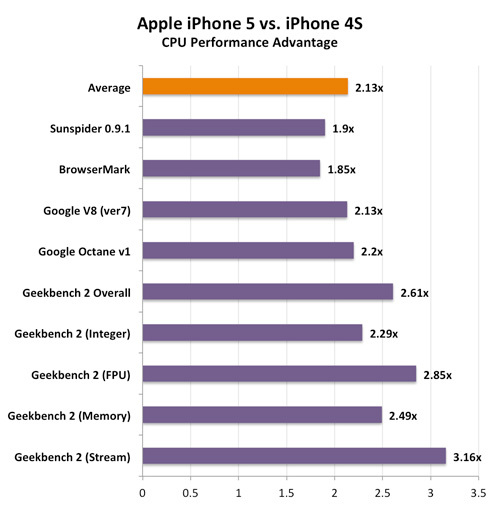 The result is compute performance that's similar to the A5X in Apple's 3rd generation iPad, but with a smaller overall die area. The A6 has a narrower memory interface compared to the A5x (64-bits vs. 128-bits), but that makes sense given the much lower display resolution (0.7MP vs. 3.1MP). As always, our performance analysis starts out on the CPU. Although we originally thought the A6 ran its two CPU cores at 1GHz, it looks like max clocks range between 800MHz and 1.2GHz depending on load. 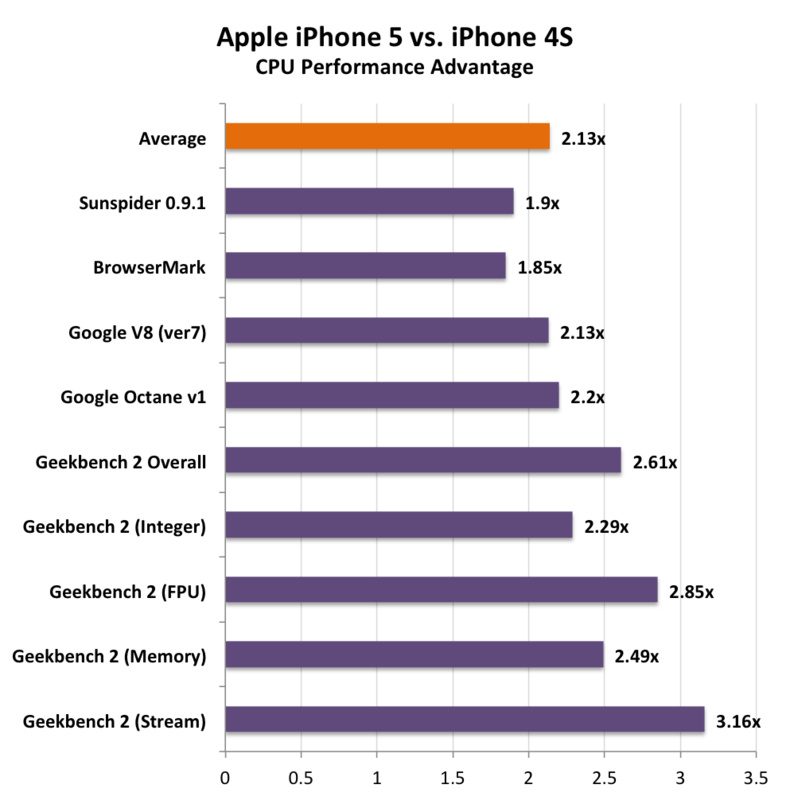 Geekbench reports clock speed at launch, which varied depending on CPU load. With an app download process in the background I got Geekbench to report a 1.2GHz clock speed, and with everything quiet in the background the A6 reported 800MHz after being queried. This isn't anything new as dynamic voltage/frequency adjustment is in all smartphones, but we do now have a better idea of the range. The other thing I noticed is that without a network active I'm able to get another ~10% performance boost over the standard results while on a network. Take the BrowserMark results below for example, the first two runs are without the iPhone 5 being active on AT&T's network while the latter two are after I'd migrated my account over. 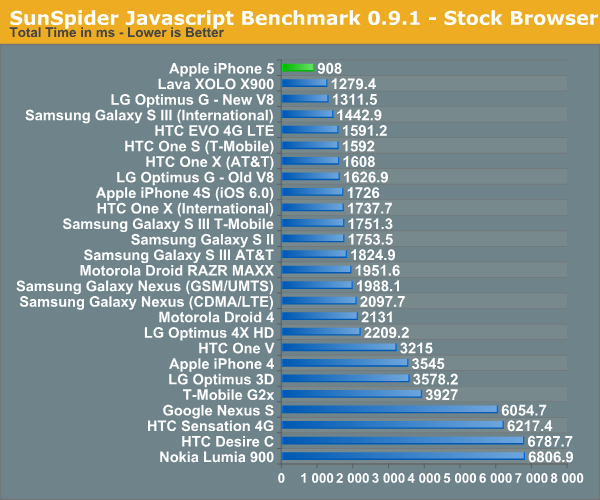 The same was true for SunSpider performance, I saw numbers in the low 810ms range before I registered the device with AT&T. 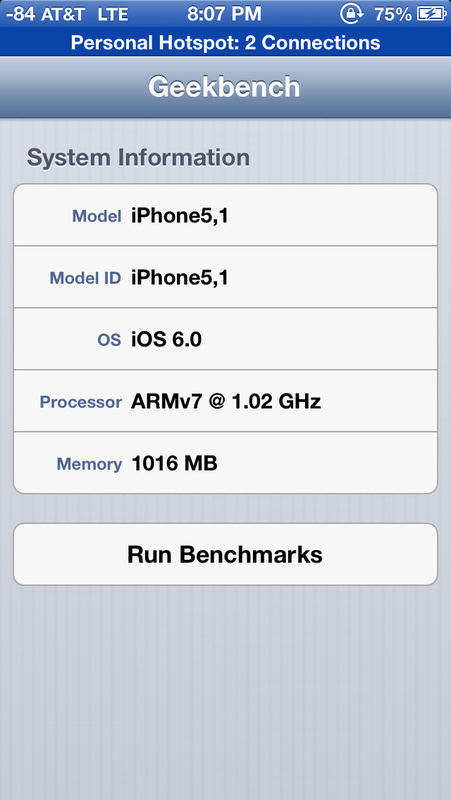 Overall, the performance of the A6 CPU cores seems to be very good. 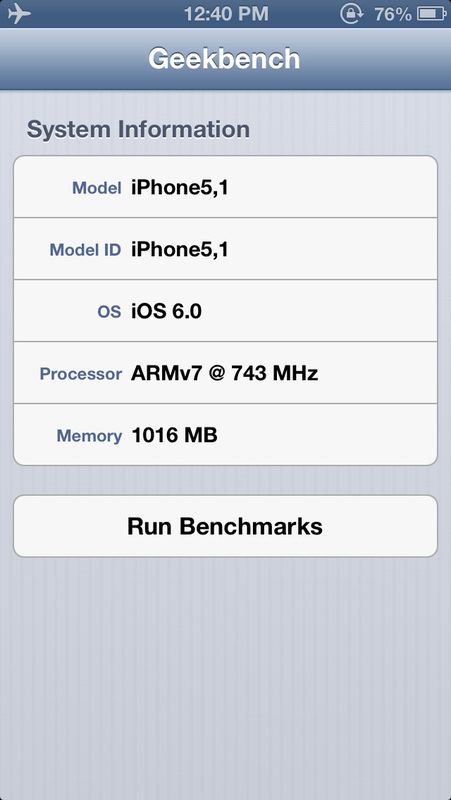 The iPhone 4S numbers below are updated to iOS 6.0 so you can get an idea of performance improvement. As we mentioned in our earlier post, SunSpider is a small enough benchmark that it really acts as a cache test. The memory interface on the A6 seems tangibly better than any previous ARM based design, and the advantage here even outpaces Intel's own Medfield SoC. 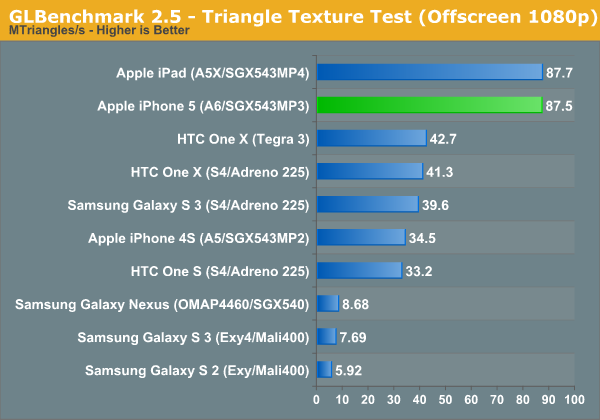 Here we see huge gains over the iPhone 4S, but much closer performance to the One X. 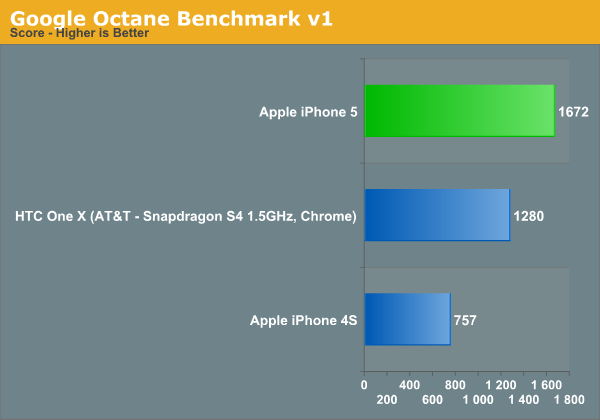 In the case of Google's V8 benchmark the two phones are effectively identical, although Octane gives the iPhone 5 a 30% lead once more. 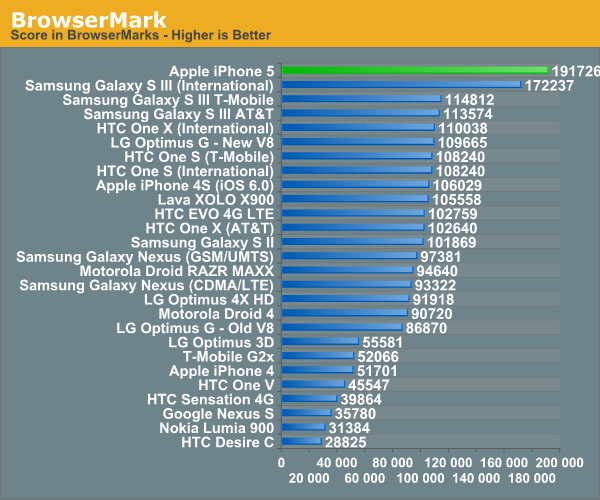 This is hardly the most comprehensive list of CPU benchmarks, but on average we're seeing the iPhone 5 deliver 2.13x the scores of the iPhone 4S. We'll be running more application level tests over the coming days so stay tuned for those. Before we got a die shot of Apple's A6 we had good information pointing to a three core PowerVR SGX 543MP3 in the new design. As a recap, Imagination Technologies' PowerVR SGX543 GPU core features four USSE2 pipes. Each pipe has a 4-way vector ALU that can crank out 4 multiply-adds per clock, which works out to be 16 MADs per clock or 32 FLOPS. Imagination lets the customer stick multiple 543 cores together, which scales compute performance linearly. The A5 featured a two core design, running at approximately 200MHz based on our latest news. The A5X in the 3rd generation iPad featured a four core design, running at the same 200MHz clock speed. 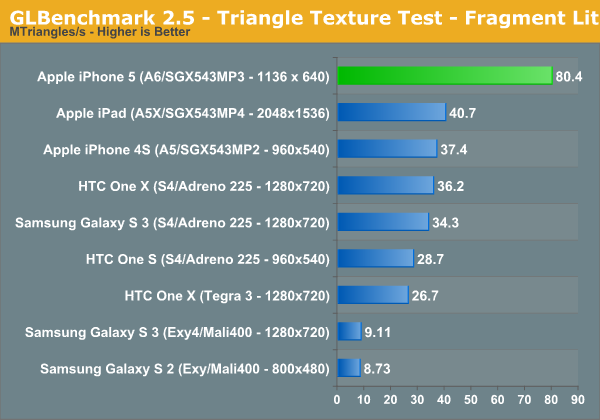 The result is peak theoretical GPU performance that's near identical to the A5X in the 3rd generation iPad. The main difference is memory bandwidth. The A5X features a 128-bit wide memory interface while the A6 retains the same 64-bit wide interface as the standard A5. 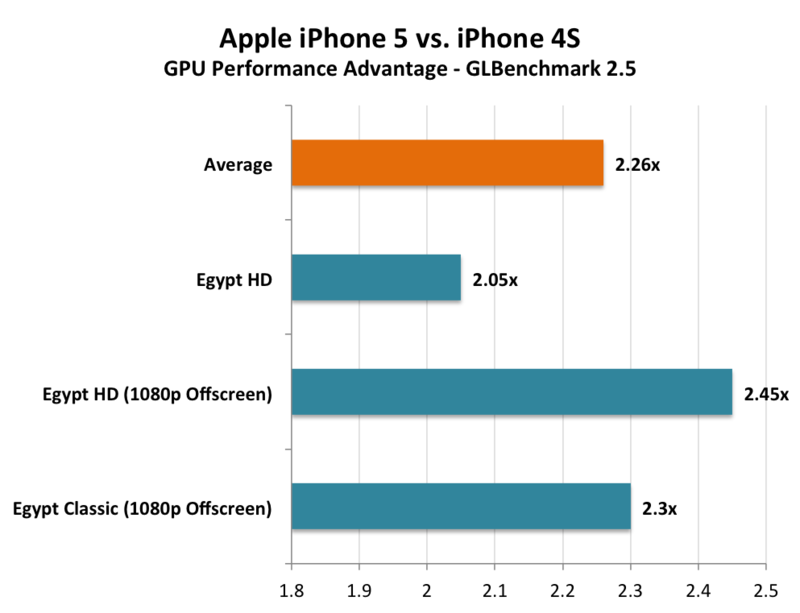 In memory bandwidth limited situations, the A5X will still be quicker but it's quite likely that at the iPhone 5's native resolution we won't see that happen. 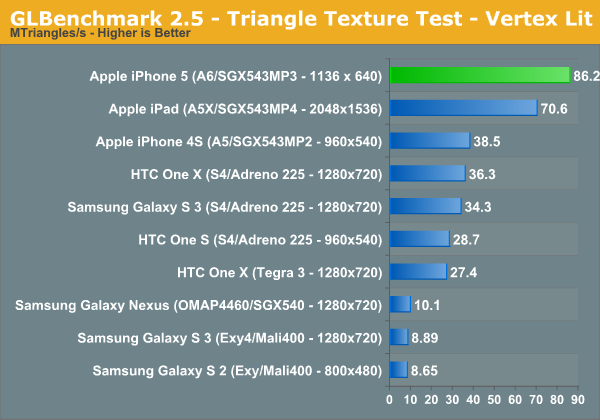 We ran through the full GLBenchmark 2.5 suite to get a good idea of GPU performance. Note that the 3rd gen iPad results are still on iOS 5.1 so there's a chance you'll see some numbers change as we move to iOS 6. 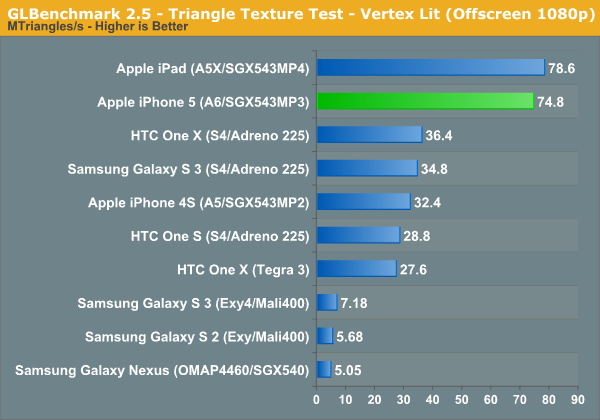 The iPhone 5 nips at the heels of the 3rd generation iPad here, at 1.65GTexels/s. The performance advantage over the iPhone 4S is more than double, and even the Galaxy S 3 can't come close. 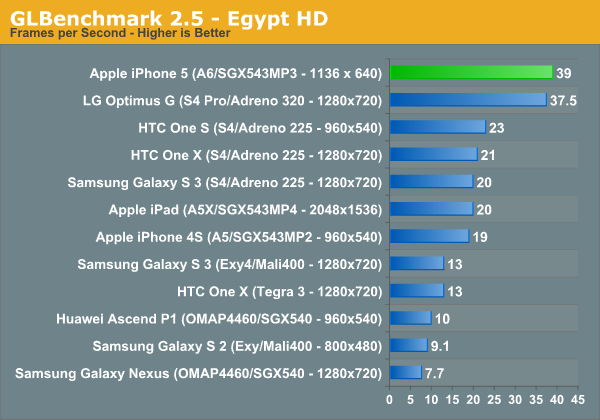 Egypt HD was the great equalizer when we first met it, but the iPhone 5 does very well here. 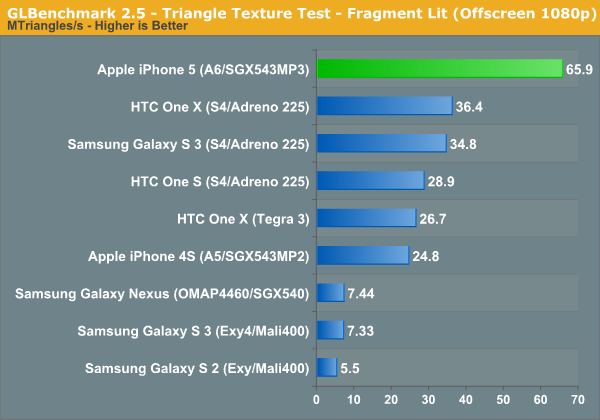 The biggest surprise however is just how well the Qualcomm Snapdragon S4 Pro with Adreno 320 GPU does by comparison. LG's Optimus G, a device Brian flew to Seoul, South Korea to benchmark, is hot on the heels of the new iPhone. 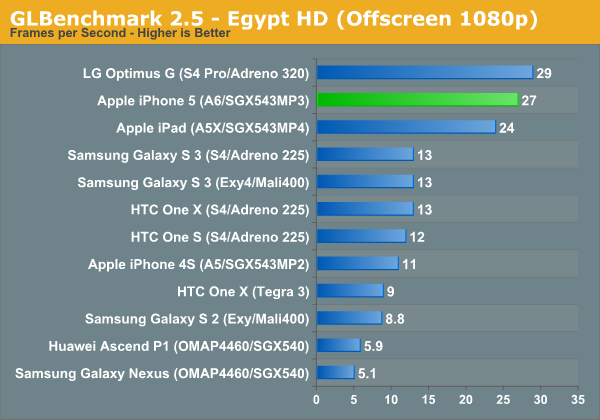 When we run everything at 1080p the iPhone 5 looks a lot like the new iPad, and is about 2x the performance of the Galaxy S 3. Here, LG's Optimus G actually outperforms the iPhone 5! 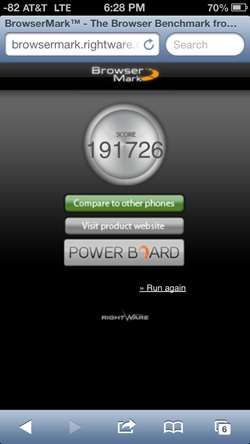 It looks like Qualcomm's Adreno 320 is quite competant in a phone. 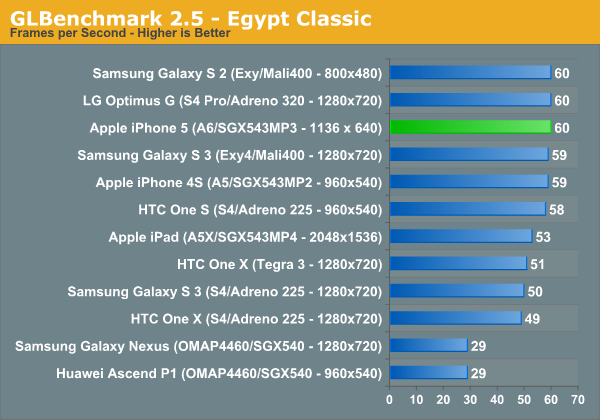 The Egypt classic tests are much lighter workloads and are likely a good indication of the type of performance you can expect from many games today available on the app store. 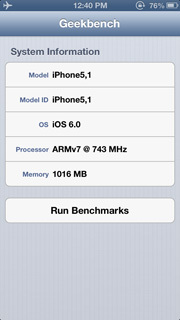 At its native resolution, the iPhone 5 has no problems hitting the 60 fps vsync limit. Remove vsync, render at 1080p and you see what the GPUs can really do. 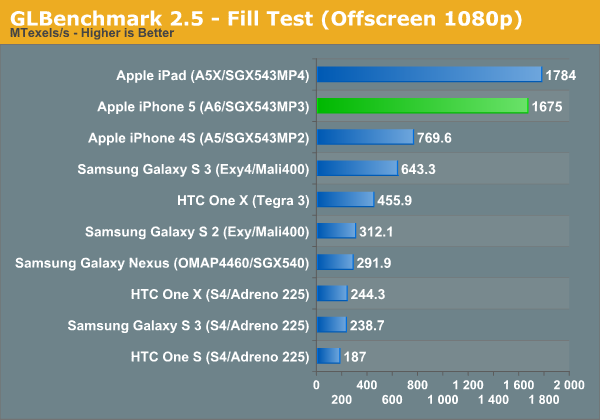 Here the iPhone 5 pulls ahead of the Adreno 320 based LG Optimus G and even slightly ahead of the new iPad. 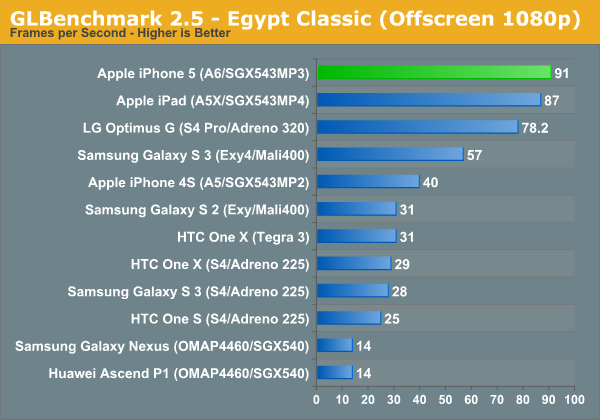 Removing the clearly vsync limited result from the on-screen Egypt Classic test, the iPhone 5 performs about 2.26x the speed of the 4S. If we include that result in the average you're still looking at a 1.95x average. As we've seen in the past, these gains don't typically translate into dramatically higher frame rates in games, but games with better visual quality instead. 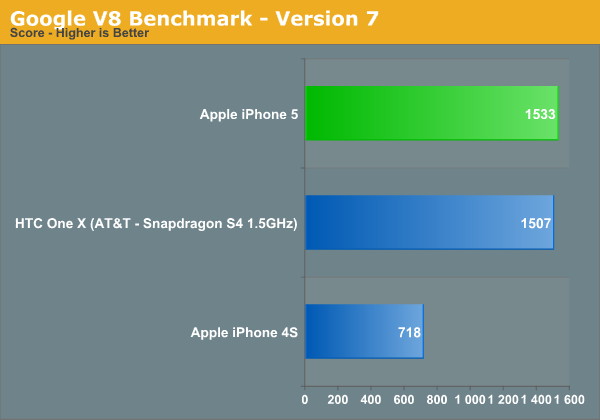 We still have a lot of work ahead of us, including evaluating the power profile of the new A6 SoC. 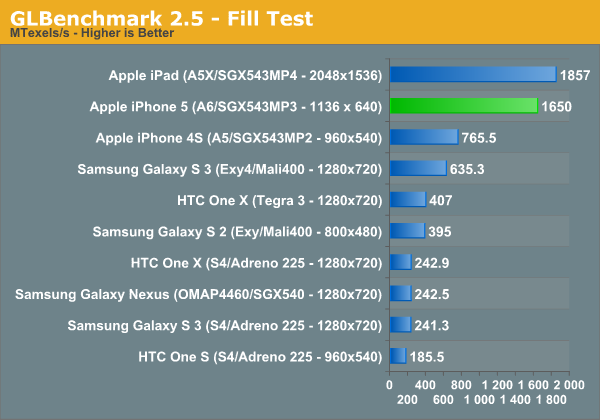 Stay tuned for more data in our full review of the iPhone 5. 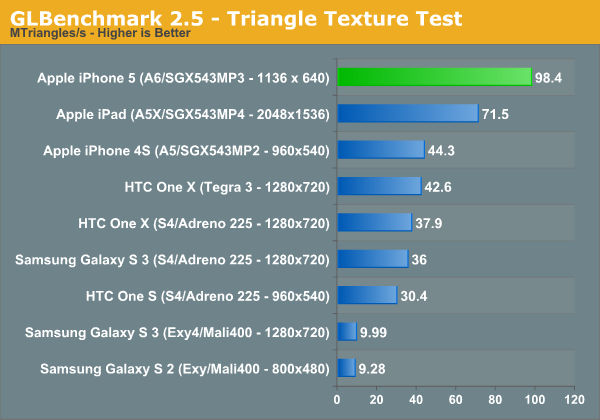 Certainly left the other devices smoking.... Thing is, the iPhone 5 -excels at what the PS VITA should have been good at, but fails at what a smartphone should be capable of, thanks to the unforgivably horrible Maps app. Ditto. It works very smoothly for me, it's definitely replaced my old standalone GPS (which can take several minutes to lock, and a minute to calculate/recalculate the route!). I've also enjoyed being able to tell Siri to get me directions to <name of a place> and have it just work. Yeah REALLY great Maps app.